Two small circular lacquer dishes, each with a flat well and rounded sides, and supported on a short, straight foot. Each interior is inlaid with carefully selected pieces of mother-of-pearl. One depicts a cavalry soldier, mounted on horseback, holding a long spear and riding along a riverside; the other depicts three men in combat; the lower right-hand figure holds his spear overhead towards the runner in front, whilst a third person stands on the edge of a cliff, performing some sort of magic with his sword towards the runner. Each scene is encircled by a band of circular decoration. The cavettos are respectively adorned with ruyi and floral patterns. The exterior and the base are covered in black lacquer. 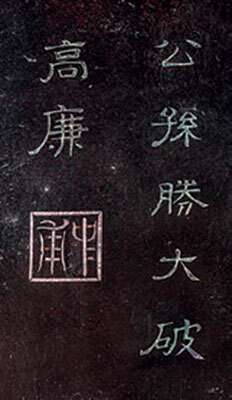 Each base is inscribed with seven Chinese characters, respectively reading Qin Ming Ye Zou Wa Li Chang (Qin Ming flees from the rubble ground) and Gong Sun Sheng Da Po Gao Lian (Gongsun Sheng defeats Gao Lian), and each follows a square seal reading Zhong Fu. Both dishes depict scenes derived from the novel Shui Hu Zhuan, also known as Water Margin or Outlaws of the Marsh, considered one of the four great classical novels of Chinese literature. 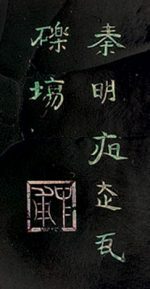 The story, set in the Song dynasty (960 – 1279), tells how a group of 108 outlaws gathered at Mount Liang to form an army to resist foreign invaders and suppress rebel forces. 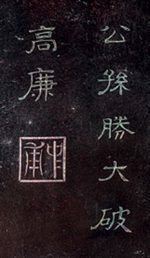 A character called Qin Ming, nicknamed ‘Fiery Thunderbolt’, is one of the heroes who appears in chapter 34: originally an imperial general, he was accused of rebelling and all his family was executed; the scene on the dish depicts his flee from the ruins to Mount Liang after his misfortune. Gongsun Sheng, nicknamed ‘Dragon in the Clouds’, is a Daoist priest. His fight is described in chapter 54, where he performs magic to defeat Gao Lian. The mark Zhong Fu might be the maker’s mark, like the famous mark of Qian Li. 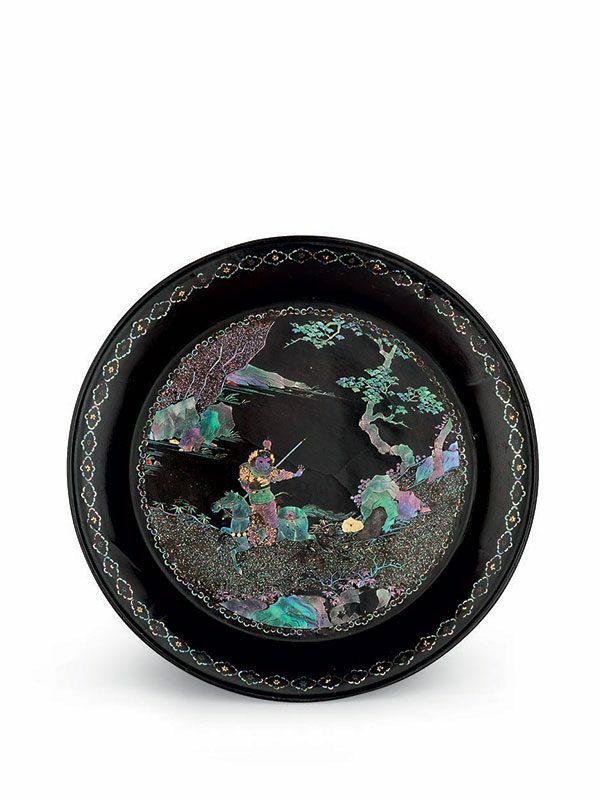 This type of small mother-of-pearl inlaid lacquer dish was popular during the Ming and Qing dynasty, and often depicts stories derived from classical novels. 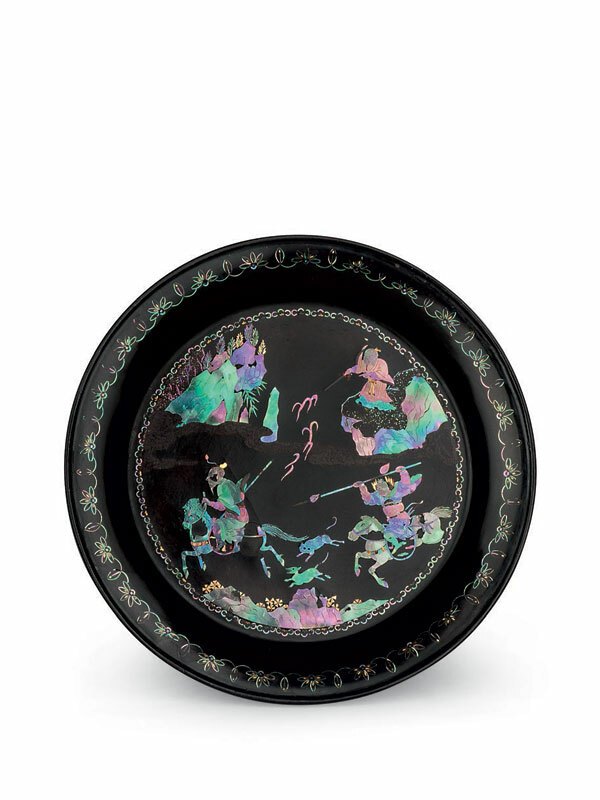 A dish of similar size, depicting the Romance of the Western Chamber and with a Qian Li mark on the base, is dated to the Ming dynasty and is in the collection of the Nanjing Museum. Two further pairs of circular dishes of similar size and decorated in a similar technique are respectively in the collections of the Shanghai Museum2 and the Muwen Tang collection. A pair of square dishes similarly decorated with poems on their bases is in the Baoyizhai collection.